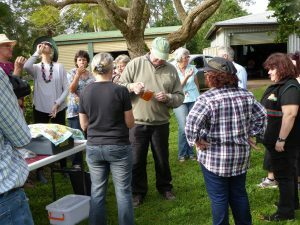 In the classroom at ACE Lismore you will learn about bee morphology, nesting biology, foraging behaviour, importance of bees in natural systems, stingless beekeeping around the world, and the effectiveness of stingless bees for pollination of farms and gardens. The benefits, risks and pitfalls when purchasing a hive will also be discussed. We will look at the properties of stingless bee pot-honey; the development of the two box honey hive, and the significant benefits of this design. After the classroom component students are invited to visit Nashua Native Bees where you view the bees working on a macadamia farm and methods of hive propagation and honey extraction will be demonstrated. The session will conclude with the tasting of freshly harvested pot-honey. Bring your lunch and enjoy this afternoon in the field. This workshop is delivered by Frank Adcock. 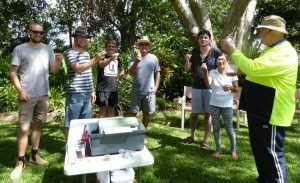 He acquired his first Tetragonula carbonaria native bee hive in 2001 as a trial to pollinate macadamias. 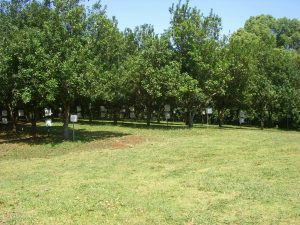 This small start evolved into a business, “Nashua Native Bees”, which supplies hives to pre-schools, primary and secondary schools, home gardens and growers of macadamias, avocados and exotic fruits. In addition he delivers workshops to schools, landcare groups as well as ACE Lismore. Nashua Native Bees have developed a suite of hives to suit our area for pollination and extraction of native bee honey. Frank’s business has delivered over 1500 hives to the community and counting.